The Canon MG3050 is a part of the Canon Pixma series of printers made for home and office use.The printer is designed to use less ink than other similar printers.The printer uses PG545 and CL546 ink cartridges as well as PG545XL & CL546XL ink cartridges.This printer is a compact yet versatile device with good quality results and photo print capability when Canon MG3050 Ink Cartridges are used with it. It is all-In-one colour printer, scanner and copier with Wi-Fi connectivity and cloud features which is a suitable option for home users. The printer ensures to provide more savings when anyone use it. As it uses high-capacity Canon MG3050 Ink Cartridges, one can cut the printing expenses by 30% lower than one can possibly have with the other options. Designed for the home users, the printer has a pretty uninspiring boxy setup. Built on a budget, the Canon MG3050 has no display and there are just a series of buttons and LEDs. Though the printer navigation options are limited, there are some advanced features such as WiFi and Cloud printing. That connects the printer with other devices to send images. An uninspiring design lets the Canon MG-3050 down. Finding a home for it may be difficult as its dimensions are larger than some of the competition. The Canon MG3050 is a low budget feature packed all-in-one printer with a number of wireless solutions such as printing, scanning and copying prints.It is a versatile machine that ensures convenience and simplicity for all your printing needs.The printer operates at quick speeds and has a Wi-Fi-enabled feature.Though it has a pretty uninspiring boxy setup, it does the business as a printer, scanner and copier. It includes wireless compatibility to print capably from phones, tablets and laptops, as well as desktop machines. How to replace the cartridges of Canon MG3050 printer? Step 3:Open the cover to replace the cartridges. Caution: Do not hold the FINE cartridge holder to stop or move it forcibly. Do not touch the cartridge holder until it stops completely. Step 5:Remove the empty cartridges. Push the FINE cartridge in and up firmly until it snaps into the place. Step 8:Close the cover. If the alarm lamp lights or flashes after the cover is closed, take appropriate action. Step 9: Adjust the print head position. Step 10: After replacing the FINE cartridge, align the printhead if you still receive errors. Q. How many pages will my Canon MG3050 Ink Cartridges can print? A. Printing a text document doesn’t use as much ink, as when you print a photo. It depends on what you are printing. The cartridges supplied on this site produce at least as many pages, as those you get from the original suppliers. Canon MG3050 Ink cartridges come in a different pack, which have different capacity to print pages. Each cartridge can print around 400 pages. A. Yes, Wifi networking is supported by Canon MG3050 printer. It also supports cloud printing. Q. How to check the ink levels of my Canon Pixma MG4250 ink cartridges on my printer? Q. Why the cost of the compatible Canon Pixma MG4250 ink cartridges priced lower than the original brand? A. The compatible Ink Cartridges provided on Printer Ink Cartridges are the remanufactured cartridges that are filled up by the professionals and are tested for high-quality performance. They are low in cost as we do not spend much on its packaging cost but aim at providing high-quality ink and page yield as the original ones. Q. The Canon MG3050 offers Effortless home printing, scanning, and copying feature. How does this prove to be beneficial for its users? A. The Canon PIXMA MG3050 printer is a part of Canon Pixma series printer that offers a versatile All-In-One range for printing, scanning and copying documents quickly and simply. Built for your everyday printing work, from text-heavy documents to colour photographs, this Wi-Fi-enabled multifunction printer is housed in a compact, desk-friendly design. The printer ensures to provide more saving options for its users. Its high-capacity Canon MG3050 Ink Cartridges can cut the overall printing expenses than one can possibly have with the other options. Q. What is the major drawback of Canon MG3050 printer? A. With uninspiring body setup, the printer has No LCD or LED display. Q. Can I use XL cartridges for this printer? A. Yes, you can print more pages with the XL Canon MG3050 Ink Cartridges available on this site. Q. Can I expect the delivery of my Canon MG3050 Ink Cartridges on time? Do you take extra charges for delivering an item on time other than the delivery charges taken before at the time of order? A. All the orders are delivered by Fastway Couriers and will require a signature at the time of delivery. About 90% of the orders that are received before 12 noon are despatched on the same day. It might take 1 - 2 business days for delivering an item. We do not offer any extra charges rather than the delivery charge for delivering an item to you on time. However, our delivery partner will attempt to make two deliveries to your doorstep and any unsuccessful deliveries will be returned to the central depot or to our warehouse. After that, any further delivery attempt will incur an additional charge of €4.95 inc VAT. Q. I cannot use scan function of the printer as my printer Canon MG3050 is running out of Ink. what should I do? A. You can use the other functionalities of the printer even if the Canon MG3050 ink cartridges are running out of ink by following the below steps. But we would recommend replacing the empty cartridges as soon as possible as it may affect print quality of the printouts. Q. Can I use only black ink cartridge in my Canon MG3050 printer or do I need use color as well? A. 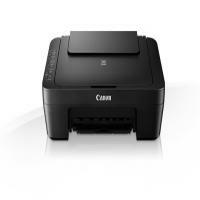 The Canon MG3050 printer requires both Black and colour Canon MG3050 ink cartridges to print in any colour printout. If any of the cartridges are running out of ink, in that case, you can print the document in gray scale mode by the time you replace your colour cartridge. Also, you can follow the manual to apply the setting in your printer driver to use colour ink to print black in the case when you are running out of black ink. Q. Can you advise me the compatible cartridges for my Canon MG3050 printer? I know that it uses one black and one colour cartridge but I don’t know which one to order. You can order the cartridges once you have added them to the cart. For any printer model, you just need to search the cartridge by the printer model in the search bar and you will get the list of cartridges that works best for your printer. Q. The printouts from the Canon MG3050 printer have ink spots when I perform borderless printing. I have tried printhead cleaning but the problem remains the same. Are my cartridges leaking? Q. How much ink is contained in the compatible cartridges you sell for Canon MG3050 printer? A. The compatible Canon MG3050 ink cartridges have sufficient in ink quantity to print 400 pages per cartridge. Please note that there is certain printer maintenance process like the print head cleaning which is essential for optimum print head performance consumes ink from the cartridges. Therefore you might get less number of pages printed from the quantity of the pages that are mentioned online. Q. I have been buying ink from you for my Canon MG3050 printer. Now I am planning to buy Canon Pixma MX495. Do they use same ink? A. Yes the compatible Canon MG3050 ink cartridges work fine with the Canon Pixma MX495. Once you select a particular ink cartridge on our website the list of the printers with which it can work is also mentioned at the bottom of the page. We would still recommend you to find cartridges for both the printer by searching the printer model number individually in the search bar of our website.